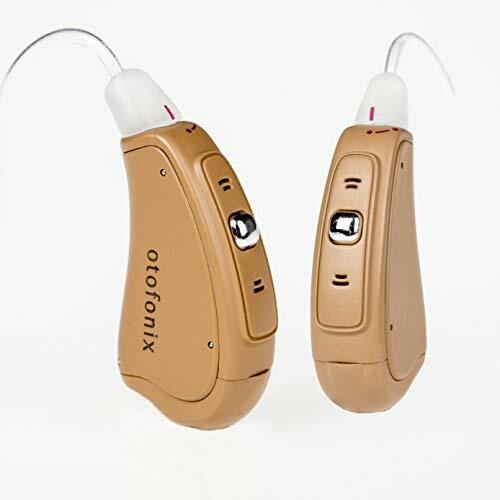 Help your hearing organs function well with the Otofonix Apex Hearing Amplifier. Let this device adjust to the needs and demands of your environment for maximized use. The Otofonix Apex Hearing Amplifier offers three pre-set configurations that can be adjusted easily. Firs among these configurations include a standard setting for regular listening. This will work excellently in natural environments encountered by an individual. Another pre-set shape is the Noisy setting, which lessens background noise. Users can utilize this feature when in a noisy environment such as restaurants and other crowded places. The treble setting is also included in the configuration, which alleviates high pitched noise and feedback. These programmed configurations operate through adaptive and layered noise reduction to secure quality experience and comfort. Also, it functions with a 12-Badn digital sound processing, enhancing and maximizing the hearing quality for the user. Otofonix Apex Hearing Amplifier has four channels which users can utilize. It also works using 100% digital circuitry, offering enhanced functioning. Aside from that, it also has seven digital volume levels. Through these volume levels, users can quickly switch and control volume and configuration. Each of these works with just a single button. Fitting won’t be a problem as it is flexible yet still functional enough to fit most ear sizes. This was made possible with the formed sound tubes and ear dome tips that come in various sizes. The ear dome tips come in small, medium, and large sizes. It also a very lightweight product that makes it seem as if the user is not wearing any aid. These crucial items come in the package upon purchasing the pair of hearing amplifiers. Other items included in the package are user manual, six pieces of size 312 batteries, a cleaning brush with a magnet, and a cleaning monofilament. It offers many functions in just one device which is also very easy to control. You can use this for any surrounding and noise levels without much worries or hassle. It has a wide range of sizes that can fit with any size without affecting the comfort and functionality. Aside from this, the device’s lightweight characteristic makes it more convenient and seamless for any user. This feature makes it possible for the user to live and usually work despite having to wear a hearing amplifier. Everything a user will need to maximize the device is included already in the package. This makes the work and expenditures less while expanding the lifespan of the device itself. It has only three configurations, which are lesser compared with other hearing amplifiers in the market. It is recommended for recreational use alone. Considering the functions and features of the Otofonix Apex Hearing Amplifier, it has every person with a hearing problem needs. It has excellent facilities to ensure enhanced hearing experience, and good quality materials to make it strong and steady. Completing the enhanced hearing experience includes a cleaning kit as well. Adding more to the value and assurance of the excellence of this product is the 12-month warranty included in this product. Also, counting in the customer reviews, this product has gained the trust of many. A lot of satisfied customers had testified to the worth of their money that was made best with this device. It also had many remarks about it effectively eliminating unnecessary are also rampant. Given that this is only a device intended for recreational use, Otofonix Apex Hearing Amplifier goes way beyond expectations. It can be used for surroundings like the wildlife, where extreme weather conditions and different kinds of noise are present. Whether one wishes to go to that place for a simple walk, photography session, hunting, or scouting, this device is usable. The Otofonix Apex Hearing Amplifier is an excellent recommendation for people wanting to improve their hearing. Regardless if the individual wishes to use this for daily or occasional use, this hearing amplifier will do an outstanding job. Though this one is created for recreational purposes, users can guarantee that it is just as effective as the others in the market. The durability, comfort, and functionality of this product is something that is worth the expenditures. Those wishing to use this product for a more extended period can have it with this. As for matters regarding size and fits, Otofonix Apex Hearing Amplifier is also a good find. Regardless of the age and ear size of the user, this device will still be suitable for them. It fits a wide array of sizes and complements the lifespan as well. Even if the user grows and encounters changes in the ear sizes, this device has got them covered. Its overall quality qualifies it as an excellent companion in the wild as well. Wildlife hobbyists with hearing impairment can have this device along with them to ensure precise hearing. They do not have to worry about the quality of the sounds as the hearing amplifier will do it for them. The device also does its job of protecting itself from extreme weather conditions by itself. This was made possible by the sturdy material it is made of. Not only is this product for hearing impaired wildlife hobbyists, but also for other people working in an industry where hearing is essential. These professions include customer service personnel, attendant, and the like. Whether it’s just one ear that needs aid, or both, this hearing amplifier will do just an outstanding job. Its adjustability for such circumstances adds up to the selling factors of this product. Overall, the Otofonix Apex Hearing Amplifier is a promising product with proven results. From the products it is made of, the functions, and the comfort it provides, it is surely loveable. Despite the product being created solely for recreational purposes, it can do a satisfactory job of aiding the hearing impaired. Durability is also not an issue with this product given the tools provided to prolong its life. It also does its job well in saving up battery life efficiently for more extended use. Despite the lesser configurations offered, this hearing amplifier can still provide significant help to users with its sound enhancing and reducing quality.